Well hello there, horror friends! What have you been up to? Moving right past my embarrassing absence like nothing happened… I am enjoying the hell out of sic-fi and horror this year! Snowpiercer, Guardians of the Galaxy, the reissue of Death Spa… 2014 has been a wonderful time for cinema so far, and I truly believe my greatest adventures are yet to come. My husband (aka Russell aka crowbait) received a video game “mystery box” in the mail. 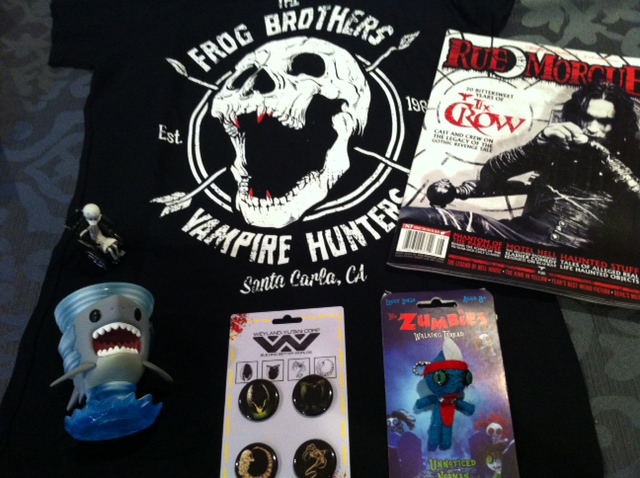 It included 2 console games and 1 t-shirt and all 3 items were a total surprise. Delightful! He’d ordered this kind of thing before, usually big boxes full of anime dvds. I’m not really into anime and my video games tastes are very narrow, but I always get REALLY excited when one of these boxes arrives. OMIGOD OPEN IT, RUSSELL. OPEN IT!!! I’ve been jealous of these mystery boxes for a while, but this latest delivery sparked an obsession. Why haven’t I seen mystery packs of horror movies? I want them! Trying to pressure my buddies at Diabolik DVD to offer them hasn’t worked, so I went on an internet quest for fun horror themed mystery boxes. While I never found exactly what I was looking for (movie packs), I did indeed find some fun options! 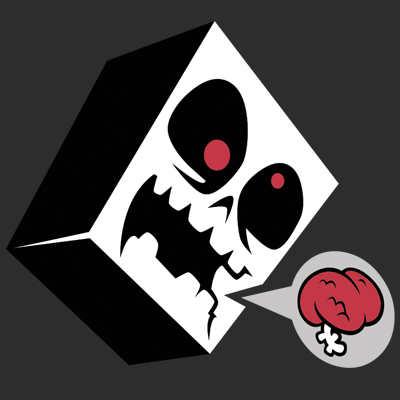 The Box of Dread, organized by genre website Dread Central, and Horror Block, organized by the folks behind mystery box subscription service Nerd Block. Each Horror Block comes with the latest issue of Rue Morgue. Each package comes with a horror-themed t-shirt in your size (meaning you select your shirt type and size when you sign up). The next block (their second set) was shipping in 2 days. I’d wanted to sign up for Rue Morgue or Fangoria in the near future anyway and finding horror apparel sized for women is always a challenge. The cost of signing up for Canada-based Horror Block here in the States is just under $30 (including shipping). That’s typically the cost of the magazine and a nerdy shirt alone, meaning everything else is a fun bonus. Add near-instant gratification? Sold. I signed up immediately and waiting for my first box to arrive has been difficult. On Thursday, after 6 days of cold sweats and sleepless nights, it finally came! Let’s take a look. The items are packed up in a rather stylish box, complete with bloody handprint and Walking Dead reference. Very nice! Note: Subscribers outside Canada, beware! If you want to maintain your surprise until the second you lift the lid, avoid the Customs Declaration sticker on the box. It lists somewhat spoilery descriptions of the contents. Personally, I avoided looking at the sticker, but delaying the reveal by mere seconds won’t be a priority for everyone. A Funko Pop! Sharknado figure! 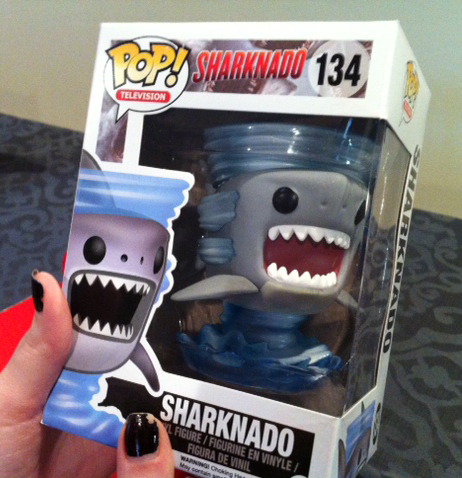 The folks at Nerd Block promised one Sharknado-related item in the July package and I was hoping this would be it. Score! If you desire a tornado shark of your own, you can find these guys for about $10 in the wild. This little guy might have to live at my desk at work. A Lost Boys Frog Brothers shirt! I never would have expected that. Love the surprise, love the design. This one’s a winner. Horror apparel prices vary, but the designers of the shirt, ShirtPunch!, sell their tees for about $10. Note: Ladies, I’m going to give you the kind of info I always want to find. This is the fitted girl’s tee option in L and I’m in the neighborhood of 38-30. Not sure how it will fare in the wash, but out of the box, the fit is good. A Nightmare Before Christmas Series 1 Trading Figure. It’s a “blind box”… sort of… I mean, the name of the character is right there on the package, so…? Anyway, the point is this item varies from box to box and not every subscriber gets the same figure. As you can see, I got Dr. Finklestein. Even though I’m not very into toys, I love this little guy! The detail is very impressive. The good doctor, his wheelchair (with working wheels), and his brain are all separate pieces. If this is the quality that can be expected, I’m tempted to track down more characters. Prices for these guys are all over the map, depending on whether you want a single or a set. Based on what I can find online, let’s set this figure at about $10 average value. Alien pinback buttons featuring the Xenomorph lifecycle! Wow! I don’t know where I’m putting them, but I love them. A little confused internet research and I’m guessing $6 value. 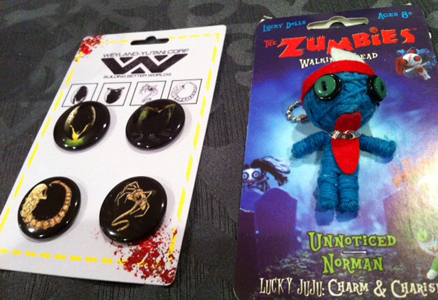 Also included is a Zumbies: Walking Thread charm doll; another one that varies from box to box. This is the one item I’m not really into, but I think we’ll put him to work when we need to decorate the Christmas tree this year. He would fit in well with Jack Skellington and his crew. Looks like you can find these fellas for about $8. 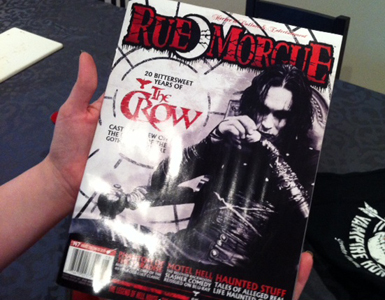 Last but not least… the latest issue of Canadian genre magazine Rue Morgue, featuring stories on The Crow, Motel Hell, Phantom of the Paradise, and more. As previously mentioned, getting this magazine every month was one of the features that convinced me to sign up. I am pleased. $10 value. So that’s my entire Horror Block stash! I am very satisfied with my first mystery box; a collection of items valued at far more than the $19.99 + shipping that I paid for it. I would recommend signing up to any horror fan who likes fun. You have 22 days to mull it over. I will continue my subscription. What shirt will I get? Will they ever include movies? I can’t wait to find out.